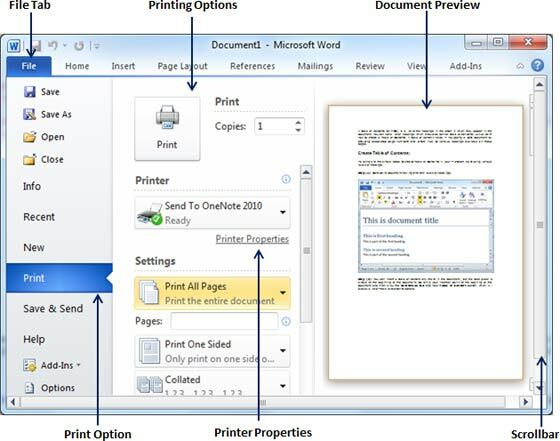 When you are ready for printing your word document, it is always recommended to preview the document before your send document for final printing. During preview of the document you might discover that set margin is not appropriate or many items may not look good after printing so better to fix them after having a preview of the document. You can also have the option to specify which pages to print, select a printer, specify the paper size on which you want to print, and set other printing options. 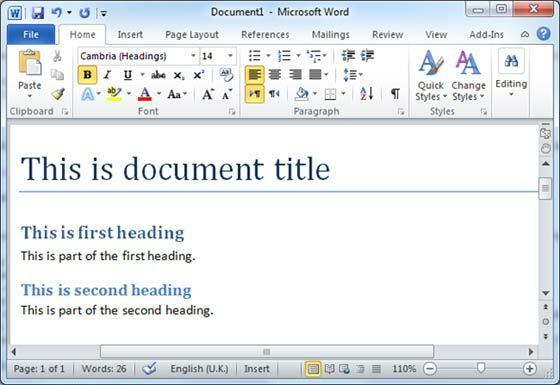 Following are the simple steps to preview your Microsoft Word Document. Step (1): Open the document for which you want to see the preview. Step (2): Click the File tab and then Print option which will display a preview of the document in the right column. You can scroll up or scroll down your document to walk through the document using given Scrollbar. In next chapter, we will learn how to print the previewed document and how to set different printing options. Step (3): Once you are done with your preview, you can click Home tab to go to the actual content of the document.